This winter I’ve found myself falling into some running patterns. Simply, I’ll get on a great running kick…then not run at all. I’m running the Monument Ave. 10k at the end of March, so I started training — running about 4 miles two times a week and 6-7 miles on Sunday, with a few shorter runs here and there. Then it got cold. This winter has been incredibly mild. It’s made me soft; any day under 60 degrees David and I would put on our Snuggies and stay in bed all day. Then I realized I was being ridiculous and got the lead out. Then the week of David’s Baptism was so busy. I had to make my house parent-approval-clean, I had a freelance deadline, and I had a lot of Settlers of Catan to play. Then I was back at it, running strong with visions of speedwork and long runs and PRs. And then the great sickness of 2012 hit. Tom got sick, then David got sick, and now I’m down. It’s not a big deal. It’s just a cold, really, but David ran a fever for 24 hours. Just a warning if you’re planning to have kids, never read the Little House on the Prairie books. You’ll save yourself a lot of worry when your baby has its first fever. Tom, if you can’t figure that out for yourself, then I don’t know if I can help you. So who knows when I’ll run again? Right now I can’t remember what it feels like to be well (Like, when I was well 18 hours ago) much less well enough to run. As with every race, my real goal is to cross the finish line. But I want to run well, too. Not necessarily fast, but well. That means feeling strong and minimizing the flailing. And getting a great race photo doesn’t hurt, either. 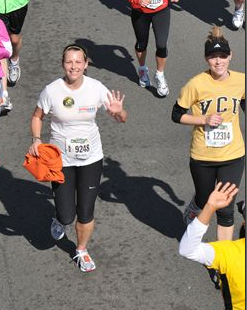 Crossing the finish line is reason enough to celebrate, which is one of my favorite things about running anyway. motherhood is its very own race…and sickness is a looooong uphill stretch. just be patient with yourself. your legs aren’t going anywhere…unless they fall off of course…which they may. I know this feeling.. I was originally planning on doing the half in Pgh but due to the 5 week cold from heck.. I now have to drop out due to lack of training.. 🙁 sometimes it’s hard but you can do it! !